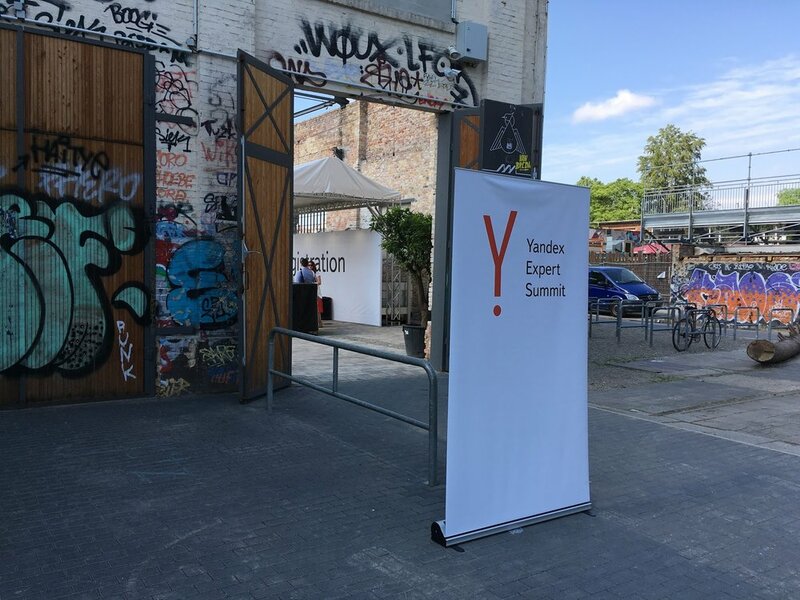 Last June, I headed to the first ever Yandex Expert Summit hosted outside of Russia for international advertisers. The conference took place in Berlin, in one of the authentic places of German culture - Haubentaucher Berlin. Surrounded by XXI century urban culture graffiti and industrial buildings, the venue itself offered quite a contrast: a wonderful open-space revealing the beauty of ‘hidden’ Berlin spaces. This post will go over the extent of topics discussed at the conference and explore what I believe will be the biggest influences on advertising within Yandex. The conference was set over the course of 2 days with a number of speakers from both Yandex and their partners. It was a great success for Yandex to have advertisers from around the world interested in its various services such as Direct (paid search), Market (online trade platform), Metrica (website analytics tool) and Money (online payment solution built in-house) among others. However, the most crucial update from my point of view was the update on Russian trade platform Yandex.Market, which was introduced on the second day of the conference. Domestic and international online stores from around the globe can reach potential customers on Yandex.Market and sell their products in more than 2,000 categories including electronics, child care, clothing and beauty. Yandex.Market SERP - click to enlarge. Users are redirected to the advertiser’s website to make a purchase. The advertiser pays for every click made on Yandex.Market to their website. Users can purchase products via the Yandex.Market platform. The advertiser pays a fixed commission to Yandex for every order that was purchased on Yandex.Market. The key element about the CPO model is that the customer purchases the product within the Yandex.Market interface. This new model simplifies the user experience as they engage with one interface only: it provides a less time-consuming experience and cuts redirections and tedious registrations on advertisers’ sites. In short, advertisers are only paying for actual purchases rather than for every click redirecting to their website. This CPO model will also be updated to offer a wider variety of payment methods to users (including Yandex.Money, QIWI, WebMoney and Sberbank Online) all available at checkout. Indeed, Yandex reports that more than 40% of online users expect to be offered different methods of payments that, if not readily available, will eventually lead them to bounce off the advertiser’s website to look elsewhere. A downside of Yandex’s new CPO model however is that it leads to the loss of traffic to the stockist website, meaning that a website owner will have limited control over branding and messaging. This model only benefits those who compete only on price, but will limit retailers who compete on service and user experience (UX). Finally, Yandex also revealed its plans to gradually switch all paid search advertising on Yandex.Market from CPC to CPO, which is in my opinion the biggest announcement of this summit. Local Russian stores have successfully been using both advertising options for a while now. Stores with not-so-complex websites but with a wide variety of products are interested in promoting their offering with CPO models. Big fashion players (like local Lamoda or Wildberries) however are currently mostly using the CPC model to encourage users to interact with their websites and carry out impulse purchases. adapt to the change, stay present on the platform and rely on Yandex capabilities to meet customer expectations. leave the platform and lose a potential wealthy audience while simultaneously pushing other marketing channels to sell their products online. Local Technology: Russian mathematicians and other scientists play a major role in Yandex’s development; Yandex was the first player on search market in Russia. Local Data: Yandex collects domestic data from users as well as provides Yandex.Metrica, it's free analytics solution for websites, which lead to even more data on a daily basis. Local Rules: Yandex abides to Russian legislation. Yandex.Market undoubtedly stands on the edge of Russian technological solutions, providing a seamless experience for local consumers. For that reason, both domestic and international online stores should be interested Yandex.Market’s CPO model. There seems to be no doubt that Yandex will keep their promise and switch their model from CPC to CPO eventually. However, as mentioned earlier, this standardisation will mostly favour businesses competing on price while hindering those competing on service and UX. Thus, the big stores selling their products on Yandex.Market might consider leaving the platform to retain website engagement, capture more data on thier customers and keep providing additional services to on-site customers. The Yandex Expert Summit gave me an opportunity to dive for 2 days into the Yandex world of advertising and its additional services like Market, Direct, Money, Maps and Metrica. The sessions were held by the heads of departments and were extremely fruitful for international advertisers coming from all around the world. It gave them a chance to enquire about the most challenging areas of Yandex’s updates and receive an answer straight away. As an official partner of Yandex, Forward3D has the advantage of getting early access to new features and participating in the closing betas. In addition to the Yandex Expert Summits, these ultimately enables the agency to prepare in advance for Yandex updates and that Forward3D’s international clients will face on the Russian market in the nearest future. As we may see from this review, Yandex.Market plays an increasingly crucial role for e-commerce advertising in Russia, emphasising the need for advertisers and online stores to be proactive in getting early insights about the platform in order to be prepared for the upcoming changes. Today, Forward3D has built its own feed management system to help clients overcome the complexities of shopping sites and to ensure feeds are optimised to improve visibility and performance, something very important when the CPO model comes into play.